Smaller than its close genetic cousin, the popular Emperor Scorpion or Pandinus imperator, the Red Clawed Scorpion is black with striking red-tinged claws, and backs up its fiery appearance with a more aggressive attitude than the Emperor. To find out more about this stinger with an attitude, we interviewed scorpion keeper and expert John Valentin Chua. Red Claws usually reach a size of 3 to 3 ½ inches, or 9-12 centimeters. 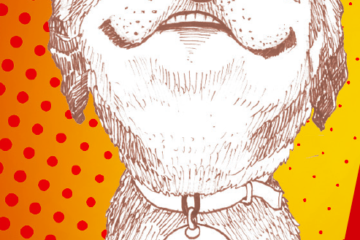 “4 ½ inches, including the tail, is the maximum size. They usually live up to 8 years in captivity, sometimes longer.” Maybe this smaller size relative to the Emperor scorpion might be responsible for its testy attitude! The Red Clawed Scorpion uses its signature claws to attack and kill its prey, which include insects, frogs, small mice, and other rodents. However, its elongated stinger is not used to catch prey. 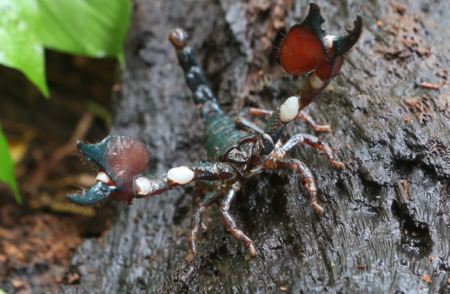 The Red Clawed Scorpion reserves its stinger for defense against larger animals, and it won’t hesitate to use it when threatened, often stinging the target repeatedly. Fortunately, the sting of a Red Clawed Scorpion is relatively mild when compared to other scorpions, and are not fatal. “They’re venom level 1,” John explains, “and they have mild pincers. Just don’t poke at them with your fingers.” The Red Claw Scorpion’s sting is reportedly similar in intensity to a bee sting. “But they’re not deadly,” reassures John. The Tanzanian Red Clawed Scorpion is known as an ideal beginner species for novice keepers, because of their low maintenance requirements. To house a Red Claw, use a glass or plastic tank. As always, floor space is more important than height when it comes to keeping scorpions. John recommends using a 2-3 inch cocopeat substrate, a hide, and a shallow water dish to help keep the humidity in the ideal range of 75-80%. Temperature should be between 24-28 degrees Celsius, or 75 to 80 degrees Fahrenheit. Misting or heat pads should not be necessary, as these scorpions are adapted to tropical climates. Because of this aggressive streak, it can be very hard to breed Red Claw Scorpions. They rarely have suitable mating partners, and may instead fight each other to the death! 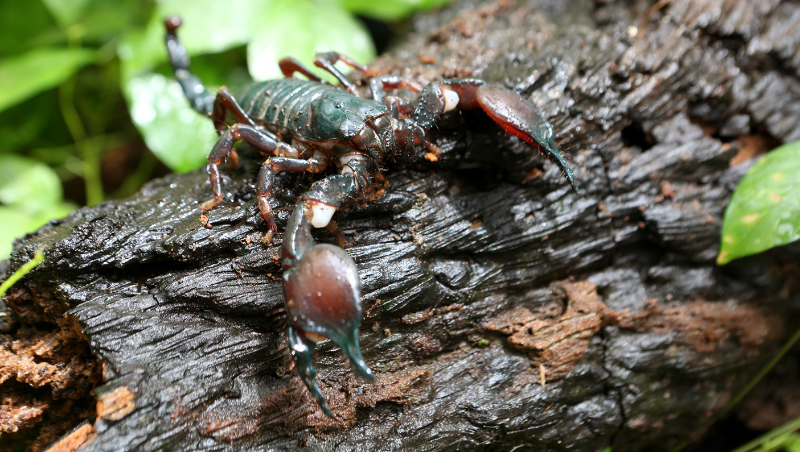 The Red Clawed Scorpion only requires feeding every 1-2 days for youngsters, while adults can be fed just twice a week. 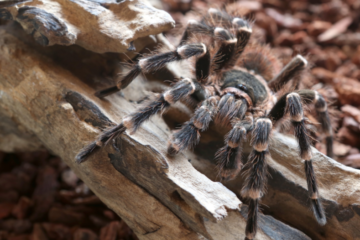 “We feed the scorplings mealworms and the occasional pinhead cricket,” says John, “and sub-adults to mature adults eat superworms, crickets, and dubia roaches. As with most scorpions, always remove uneaten food after feeding time. 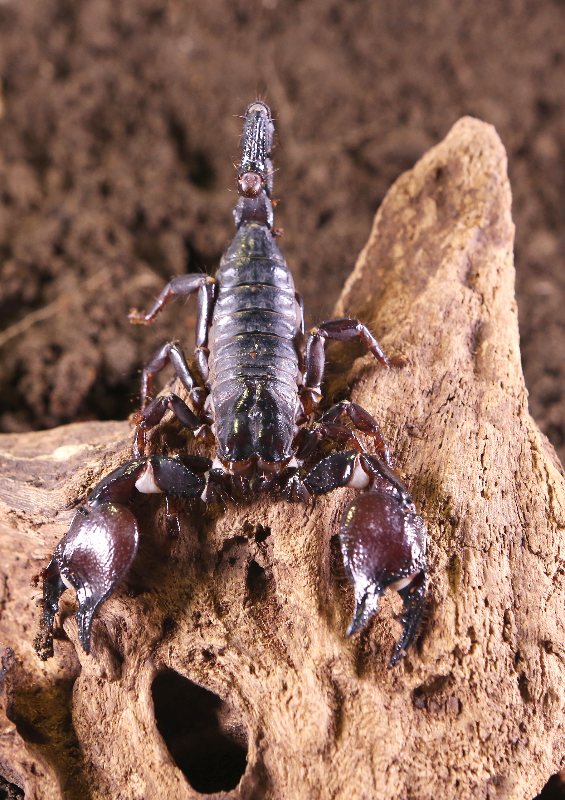 All of this might seem like a lot of trouble just for a pet, but John assures us that the Red Claw Scorpion makes a great novice pet, especially for beginners who are looking for something a bit feisty. This story appeared as “The Emperor’s Feisty Cousin” in Animal Scene’s January 2017 issue.